Leap into the next generation of digital sending with the world's fastest departmental scanner. At the intersection of HP Digital Sender and HP Scanjet performance, seamlessly integrate paper files securely into your digital workflow solution. Reclaim your time. 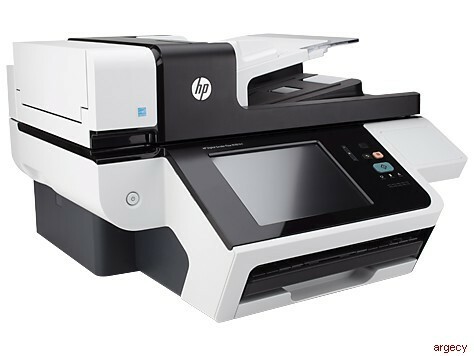 Scan up to 60 pages per minute and 120 images per minute1—even do two-sided scans. Easily manage scan jobs on the 8.07-inch HP Easy Select color touchscreen with Quick Set Profiles and included pullout keyboard. Do more with data, using multiple scan-to options—folders, FTP sites, email, USB drives, SharePoint®, and more. Count on high-volume performance, time and again—scan up to 5000 pages daily with minimal user intervention. Bring data to life with built-in OCR capabilities, then save scans in a variety of file formats, including editable text. Get fast results from single-pass scanning and HP EveryPage. Automatically remove blank pages. Manage big jobs with the 100-sheet automatic document feeder. Reliably handle scan jobs with mixed paper sizes and weights (up to legal size). Scan and send documents without worry—the HP High-Performance Secure Hard Disk helps keep sensitive data safe. Maintain security throughout the document lifecycle by enabling a variety of authentication options. Easily manage who can scan and where files can be saved, using advanced security features—including IPSec. Enable easy sharing of sensitive data when you create encrypted, password-protected PDFs. Expand document management capabilities within your environment, using a rich array of easy-to-integrate HP and third-party solutions. One-year Next Business Day Onsite repair warranty, phone and Web support included. Warranty may vary by country as required by law. Go to http://www.hp.com/support to learn about HP award winning service and support options in your region.